Muthanjan is a delicious sweet made with milk, basmati rice and condensed milk. It is often made during festivals and special occasions and is also served during Muslim weddings. 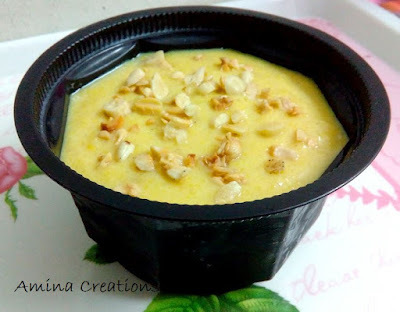 Today I am sharing an easy to prepare recipe of Muthanjan that I got from my Mom-in-law. 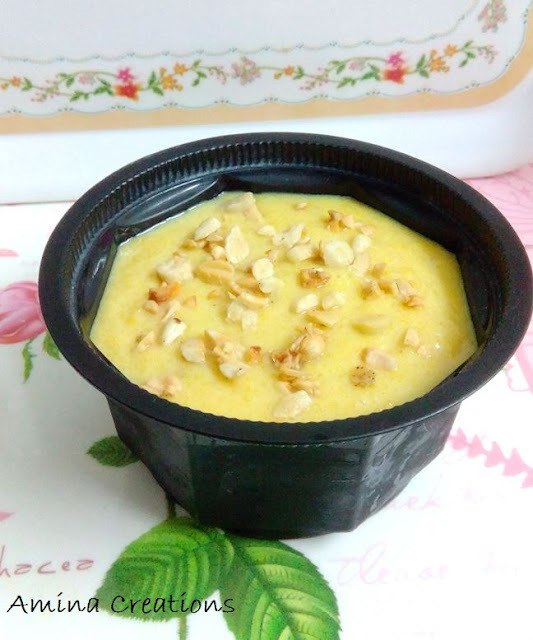 Do try this recipe and I am sure you will love it. Wash the basmati rice with water and dry over a muslin cloth. When all the water has evaporated and the rice has dried (after an hour or so), transfer to a mixer grinder and grind till it is like sooji. Transfer to a bowl and keep ready. Boil milk in a pan and switch off the gas. Milk will be added in the end. Boil water in another pan and add the rice sooji to this. Take a small sample from it with a spoon to check if the sooji is cooked. If not, cook for a few more minutes. It will now have a porridge like consistency. If not add some more water. Once the sooji is cooked, add sugar and cardamom powder. Cook for a few minutes till the sugar dissolves. Add the yellow food colour and mix well. Switch off the gas and add condensed milk and milk and mix well. Stir fry the dry fruits in ghee in another pan till golden and add to the muthanjan. Mix well and allow it to come to room temperature. Transfer to a dessert bowl and refrigerate for a few hours. Delicious and mouth watering Muthanjan is now ready. Serve cold garnished with cashews and almonds. Muthanjan usually has a thick kheer like consistency. But if it looks thin or watery, you can cook while stirring for a few more minutes till you get the desired consistency. Sometimes the sweet thickens on cooling. In that case you can add some milk and sugar to it to get the right consistency.